I will be the visiting artist for Draw On! 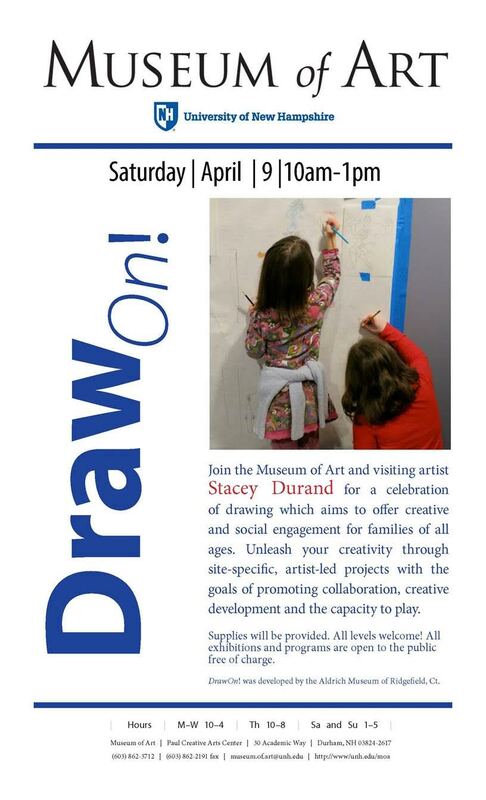 the annual community drawing event at the Museum of Art at the University of New Hampshire. This event is designed to be a "...celebration of drawing which aims to offer creative and social engagement for families of all ages. Unleash your creativity through site-specific, artist-led projects with the goals of promoting collaboration, creative development and the capacity to play. Participants can drop into the museum and explore. Hands-on activities demonstrating cityscapes, landscape drawing and collage techniques will be explored. Reference materials pointing to techniques will be available for inspiration." More information about the event can be found here and directions and parking information is available here.